Progressive reduction in custom duty & Other restrictions between members so as to achieve a ‘zero’ tarrif level. Creating a common schedule of duties tariffs & quotas when dealing with non members. Increasing their specialization through migration of industries based on comparative advantage. Removing all barriers on movement of goods, services, technology and labour between members. Creating a common fund for retraining and redevelopment of labour. The EEC succeeded in its goal of creating a common market by 1968. Prohibition on unilateral parity change: In Brettonwood system countries could change their parities in consultation with IMF alone, resulting in frequent parity change and competitive devaluation. The EMS prohibited and change without a consensus of all members. From 1979-1992 there was no parity change in EMS assuring a greater consistency in currency valuations. Dual intervention: In Brettonwood system the US didn’t participate in the intervention process. The onus of maintaining parity was always on the opposite member due to this intervention process was succesful at the lower end of variation zone but failed at the upper end due to inadequate resources. In the EMS when an exchange rate reach support point both the concerned member were obliged to intervene and support parity.This ensured that at least one Central bank had unlimited resources, at each end of variation zone. This feature guaranteed the success fo every interventions. ECU as divergence indicator: The EMS created an artificial unit called ECU as a waited average unit using all member currencies, this unit was used to record borrowing between members and as a divergence indicator. Every currency in EMS has fixed relationship with the ECU when exchange rate between 2 member country reach an intervention point, the divergence against ECU was also verified, the currency showing greater divergence was identified for taking corrective action through policy changes. This ensured that repetitive intervention did not become necessary. These features helped the member countries to achieve economic convergence in terms of parameters such as inflation, interest rates, BOP deficit etc. 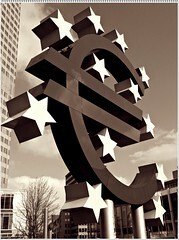 The EMI ( european monetary institute) was established to so as to function as the European Central Bank. All capital control between members were abolished so as to integrate these economies. On 31st Dec 1998 the exchange rate between all members were permanently frozen and the EURO was introduced on Jan 1 1999 the opening value of 1Euro = 1 ECU all ECU transactions where converted into EURO. Currency notes and coins denominated in Euro introduced Jan 1 2002 and all previous currencies in circulation were withdrawn by June 30 2002.